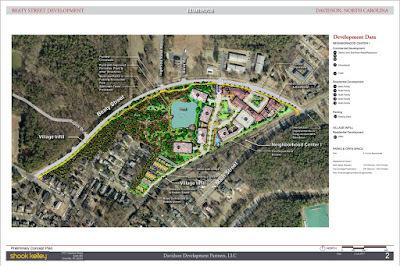 The next big brouhaha involving development, planning, and information out of Davidson Town Hall is already brewing. 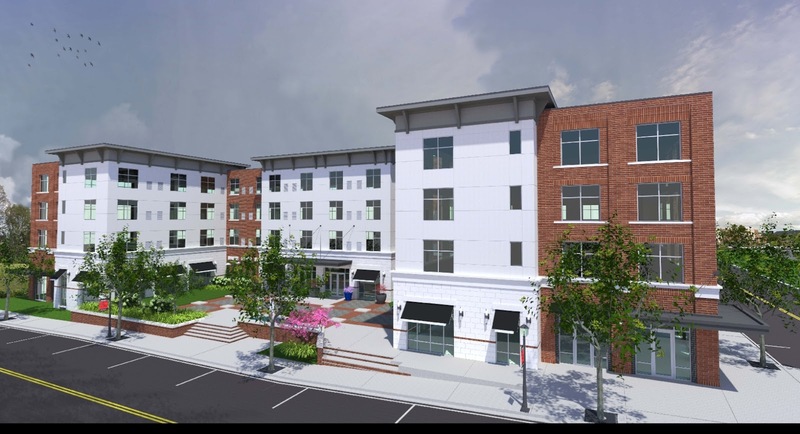 As mentioned previously, the proposed Hyatt Place hotel project at Exit 30 adjacent to the Community School of Davidson is now moving forward. It has been waiting in the wings for the Town to get past controversies like the RAP and Beaty Street RFP, but needs to get going now to ensure a vote from this development friendly Board prior to election day. On the current schedule, the Board would vote at its October meeting - the last regular meeting prior to the election. 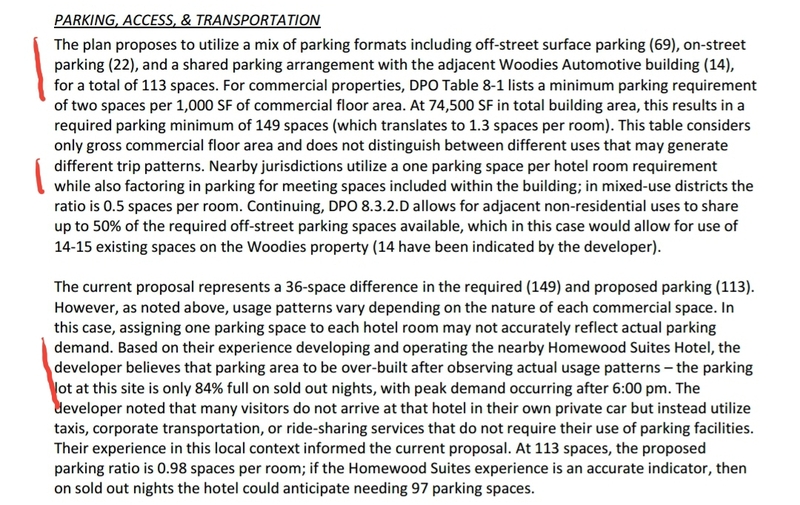 To get there, the Board, Staff, and Project Team has to smooth over what will likely be the most contentious issue of parking, However, in the new documentation released this past week, there are multiple confusing and misleading statements on this all important subject. First to level set, how many parking spaces are required and how many are being provided? On the required side that is pretty straight forward. 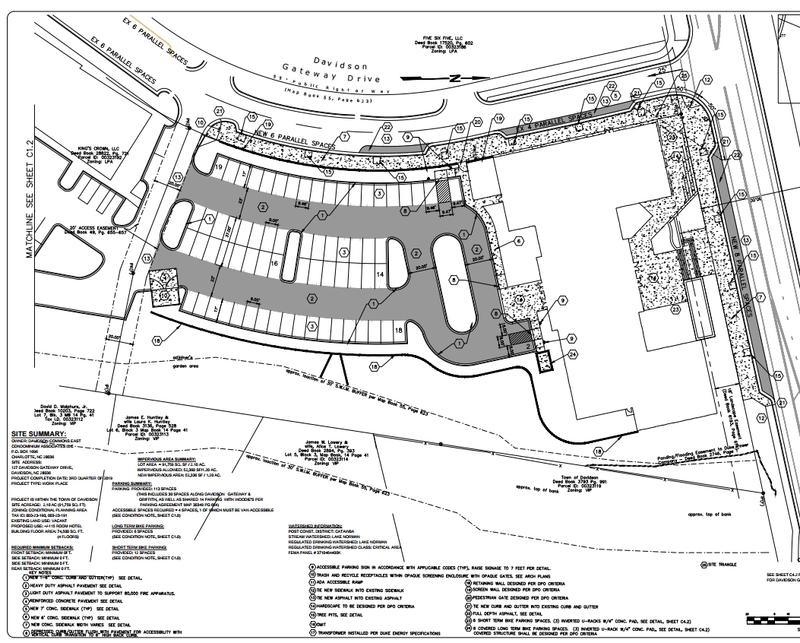 Per the Davidson ordinance, at 2 spaces per 1000 square feet, 149 spaces are required for the proposed 74,500 sq ft, 115 room hotel with bistro food service. On the provided side, there are multiple different numbers presented in the various documents. The developer schematic says 139 spaces. 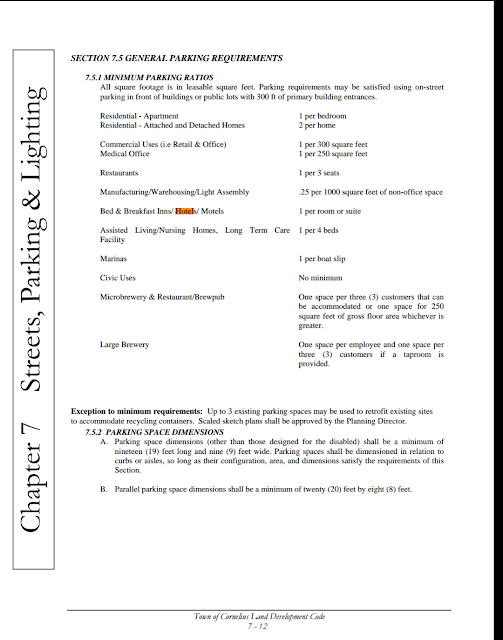 However, the rest of the documentation by town staff says only 113 spaces are provided. Other than the single inflated reference on the schematic, 113 spaces is the most referenced number in the documentation, so the following analysis will go with that. That means the developer proposal is 36 spaces deficient per Davidson's ordinance. 113 spaces is actually less than what was offered in the original plan submitted a year ago. That plan offered 118 spaces for a 115 room hotel with full service rooftop restaurant. See here for aShortChronicle's analysis on that first plan. Here is how the town staff analysis describes the 113 spaces in the new plan and its sufficiency to support the proposed hotel. Take a look at the portions next to the red markings. What you will see is that first, the parking is broken up into on-street, off-street, and shared. The numbers don't add up to 113, but based on what is there, this site will regularly rely on using 30 on-street spaces. 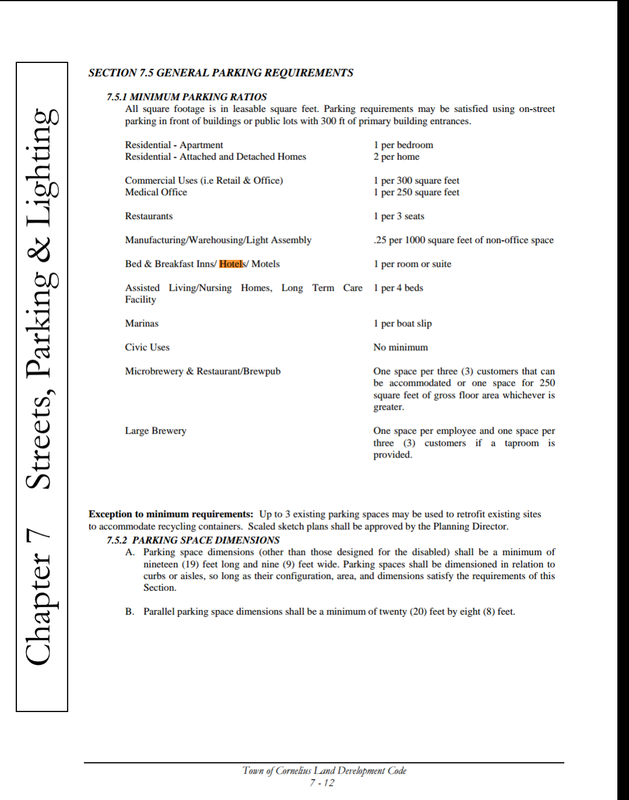 The second red mark is by the statement "Nearby jurisdictions utilize a one parking space per hotel room requirement while also factoring in parking for meeting space within the building." The third red mark shows that the so called "staff analysis" is actually just the developer's analysis regurgitated. So, why highlight these pieces? Because taken together they show a misleading misrepresentation of of the actual situation, that's why. 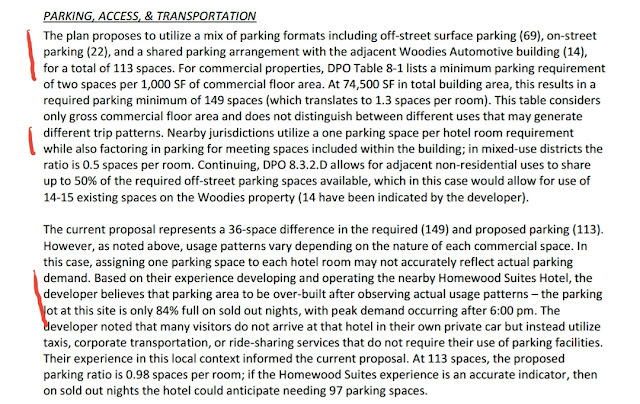 The general premise of the staff analysis rests on saying this plan fits generally accepted parking requirements for hotels compared to what "nearby jurisdictions" require. That seems reasonable enough to look at other jurisdictions since Davidson's award winning planning ordinance doesn't actually speak to hotels. But what do the nearby jurisdictions actually say? 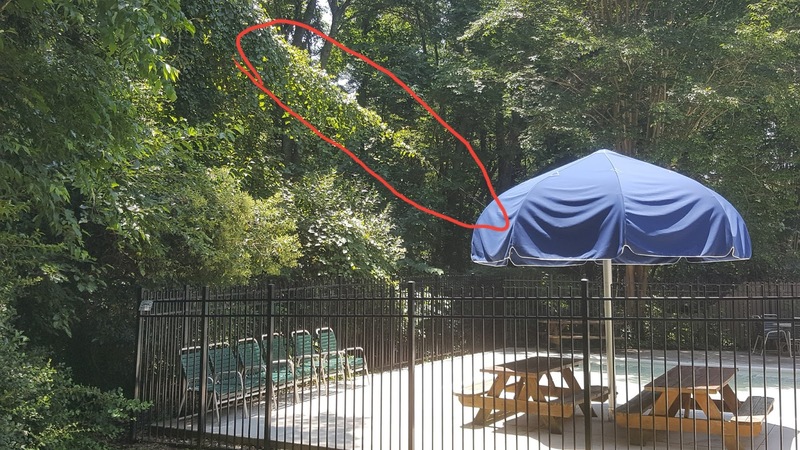 aShortChronicle checked the non-award winning planning ordinances for Cornelius, Huntersville, and Mooresville to find out. All of those ordinances do speak to hotels. Here's what they say. You will notice that the parking requirements for Huntersville and Mooresville both talk about their requirements as "off-street" parking requirements. 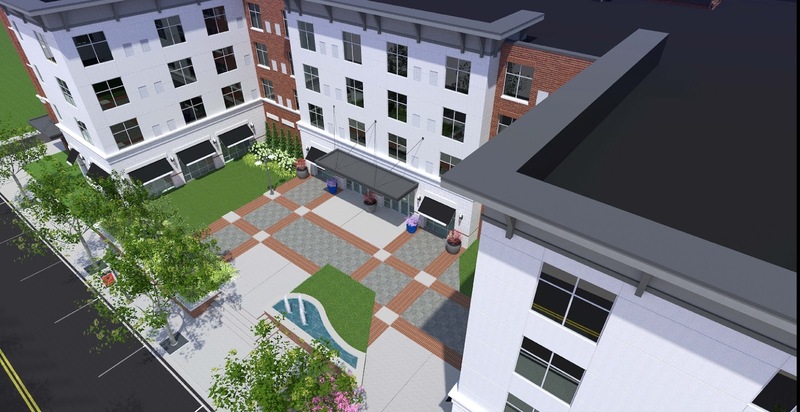 Under those ordinances the 20 on-street spaces in the Davidson hotel plan would not count. 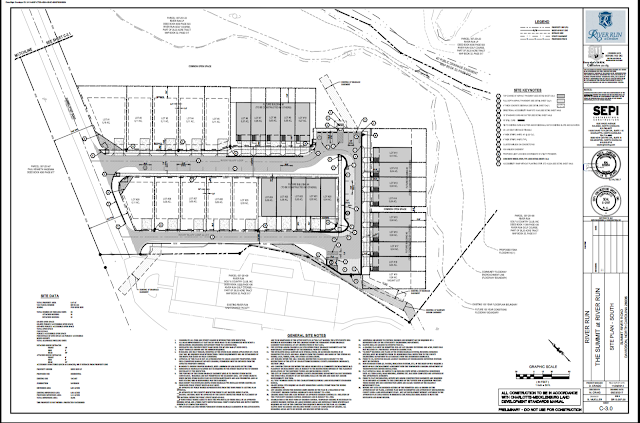 The Cornelius ordinance is closer to what the Davidson plan might meet, but that ordinance says other lots can be used if within 300 feet of the buildings primary entrances. 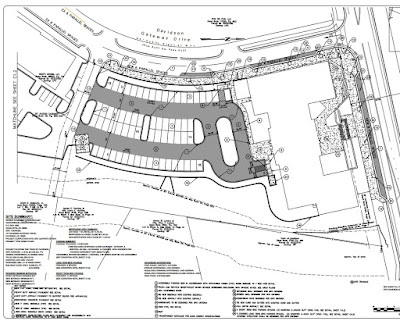 Looking at the schematic provided with the Davidson hotel application, the 14 spaces in the Woodies lot are just over 300 feet from the rear hotel main entrance. So, in the Cornelius ordinance, those might not count either. Also, in Mooresville and Cornelius there are added parking requirements for hotel staff and ancillary uses. The Davidson hotel application and the staff analysis do not directly account for these. Taken all together, the staff analysis tries to say the proposed plan in Davidson is comparable to what would be allowed in nearby towns, but according to the nearby towns' actual ordinances that doesn't appear to be the case. If the actual ordinances from nearby towns were applied, the proposed Davidson hotel would be as or more deficient than the 36 space deficiency under Davidson's ordinance when compared to Huntersville and Mooresville. The Cornelius ordinance would likely come close to the same 36 space deficiency. In fact the Davidson staff analysis appears to be much more favorable to the developer than would be allowed in those nearby towns. 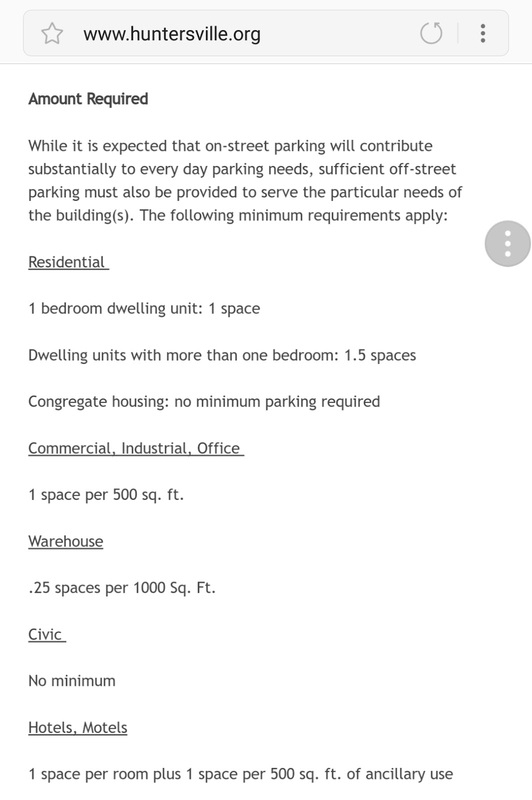 The other misleading aspect of the Davidson staff analysis is the acceptance of the developer's expected numbers and what those really mean against the reality of overall parking needs in the area. One problem with this is that the Homewood Suites parking used as a baseline is primarily if not entirely off-street parking, so the comparison of the two sites is not apples to apples. The other problem is that even if the analysis is right, and the new Davidson hotel really only needs 97 spaces on sold out nights after 6pm, that still very likely means there will be chaos the following morning if this happens on a weekday during the school year due to the facts on the ground. Those facts include that CSD K-7 school sits right across the street and dropoff in the morning will coincide with most if not all of the street parking still being in use from the previous night. Currently, the site for the new hotel is used as a de facto parking lot for CSD. While that most certainly is not the developer's responsibility or issue, the fact remains that the site owner has allowed this situation for many years and now dozens of cars currently using that space daily will have to go somewhere. Because this situation has been allowed to occur, it has artificially masked the true daily parking requirement for the overall area. Making matters worse, that says nothing about what will happen when there are special events at the school. Much of the responsibility for alleviating this lies with CSD, and the school clearly has to address this. However, Davidson's ordinance is also causing a fair amount of the problem. By allowing on-street parking to be used as part of the regular parking plan for new development in an already saturated area when by the developer's own analysis this will all but ensure issues on many weekday mornings, Davidson Town Hall is knowingly causing a problem. It is a problem that involves hotel guests who by their very nature are unfamiliar with the area and its daily traffic patterns. It is a problem that involves the safety of children walking to and from school - a school that has been there more than a decade. It is a problem of dealing with growth in a truly responsible and holistic way rather than just as an academic exercise in the Davidson Planning Department. Ultimately however, the responsibility for this lies with Davidson's Commissioners who will vote on this conditional zoning proposal. Ultimately, if they approve this plan under these conditions, they own the outcome...for now and forever. Grading at the new 306 home West Branch neighborhood off of Davidson Concord Road has been underway for quite a while now. 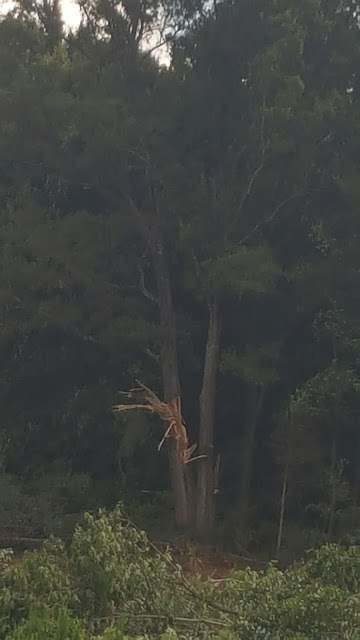 However recently the tree cutting that was inevitable has finally begun. This 3 minute video was taken on Saturday. Now, take a look at this. The below picture is the approved master plan for this neighborhood. 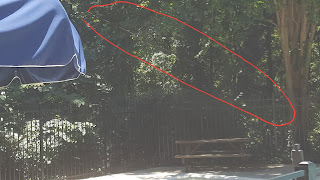 The picture below it were taken from about where the red X is. The area within the circle is the upper right side of the first two pictures and directly across the access road cut in the second two. 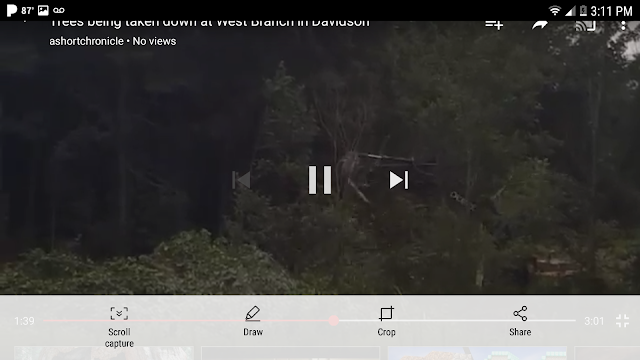 The area in the red circle is forest, and it will be going as well. The approvals for this project required only one vote of the Davidson Board, and it wasn't even for the project itself. The project was "by right". The one vote Commissioners did have was for something called a historic viewshed at the other end of the property which is largely unbuildable floodplain. However, the Board could have leveraged that vote to protect more of the land. They didn't. Now we have this, and this is why November's election is so important. DAVIDSON, NC – “Save Davidson,” a citizen group fighting the development of the Beaty Street Property is hosting an event from 7 to 9 p.m. on Thursday, August 3, at D9 Brewing Company, 11138 Treynorth Drive, Cornelius. The event is open to the public. S.H.I.N.E. (Sharing Helpful Information Now with Everyone) will include an update from “Save Davidson,” including next steps to save the Beaty Street Property. 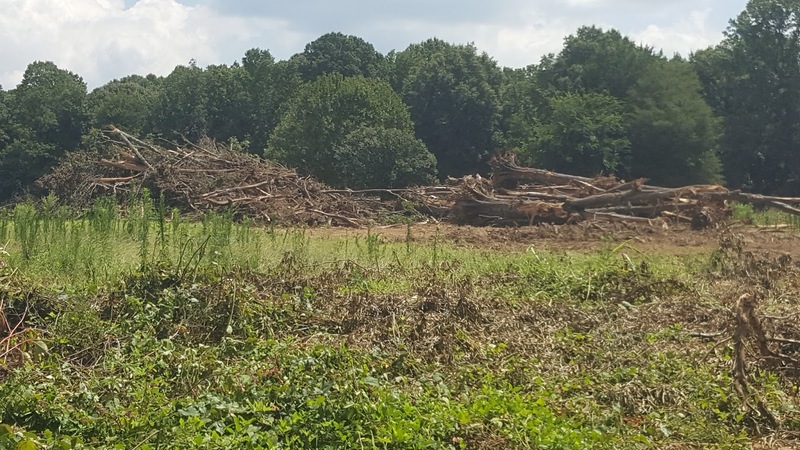 The Davidson Board of Commissioners voted on July 11 to enter contract negotiations with a private developer despite large public outcry against the development. More than 250 people participated in a protest before the meeting and 30 people spoke against the development during the public comment period. 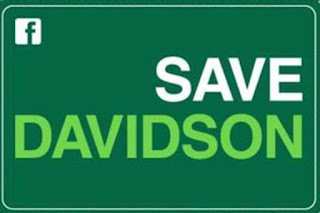 Along those lines, “Save Davidson” encourages all citizens to remain engaged considering that the contract negotiation is the first step in a long process and at each stage there is an opportunity to cancel the project. “The August 8 board meeting is another important one for citizens to attend,” says Beall. In addition to a brief update at the S.H.I.N.E. 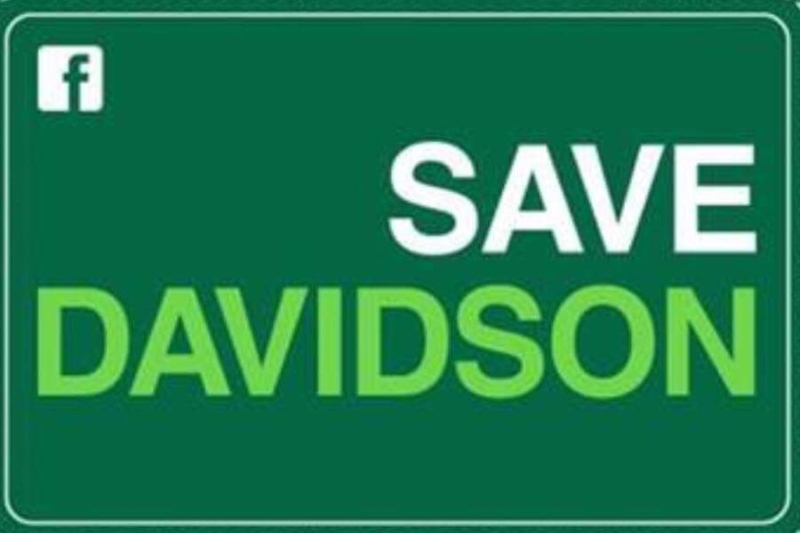 event, “Save Davidson” will share how they plan to be involved in the upcoming elections. They also will provide an opportunity for participants to share ideas and learn how to become involved. 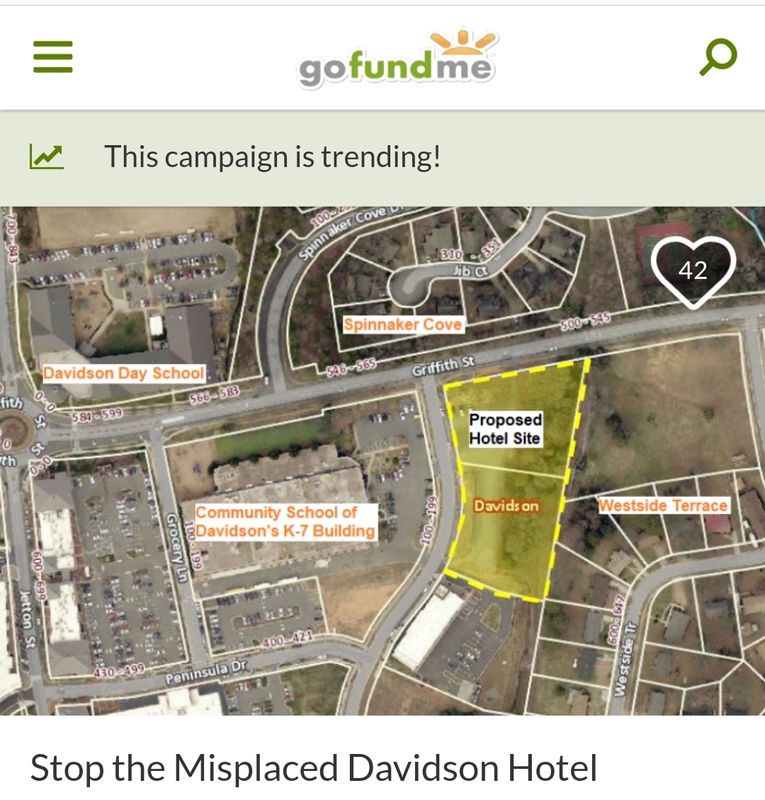 “Save Davidson” started as a Facebook page (now with 1,450+ members) and has coalesced into a group of citizens who is working to shine light on what they view as a disregard of a contract, betrayal of public trust, flawed process, lack of transparency, failure to include and acknowledge citizen input on publicly owned land along with increased traffic, loss of tree canopy and open space, and adverse effects to water and air quality. “Save Davidson” is holding “What’s Next” sessions (watch the Save Davidson Facebook page for announcements on dates/times.) The group is planning a Nature Walk on the Beaty Street Park Property at 9:30 a.m. on August 19. Diane Podolsky, a naturalist and artist, will lead the walk. For those interested in sketching, bring a sketchbook and pencils. Find more information at www.savedavidson.org. Follow Save Davidson on Facebook, Twitter and Instagram. Stay tuned for locations of the magnet mobile around town where you can make a donation for Save Davidson magnets, t-shirts and yard signs. Receive updates via e-mail; write savedavidson@gmail.com to add your name to the list. A shadow Town Attorney for Davidson Town Hall? That's what one would believe after reviewing the results of a recent public records request on former Davidson long-time Town Attorney, Rick Kline. At least that would be the case when it comes to real estate transactions involving the town. Regular readers of aShortChronicle will know that before he resigned his position with the town in 2015 (effective June 30, 2016), Mr Kline's position as Town Attorney and the conflicts that presented with his private practice representing developers was a hot topic for this blog. This list of conflicts was problematic enough that Mr Kline even mentioned them as part of his comments when the position was handed over to current Town Attorney, Cindy Reid. Below is an excerpt from a May 2016 column penned for the Herald Weekly and re-posted here. That column covered why aShortChronicle covers what it does. When it came to conflicts of interest, Mr Kline was the example. "Some of those columns were down in the weeds on the state law governing exactly what is a conflict. 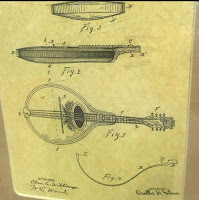 Others covered specific examples – more than one involving the long time Davidson town attorney, Rick Kline. Those columns in particular seemed to strike a nerve. Kline announced his retirement a few months ago, and his replacement was announced at the May 10th Board meeting. 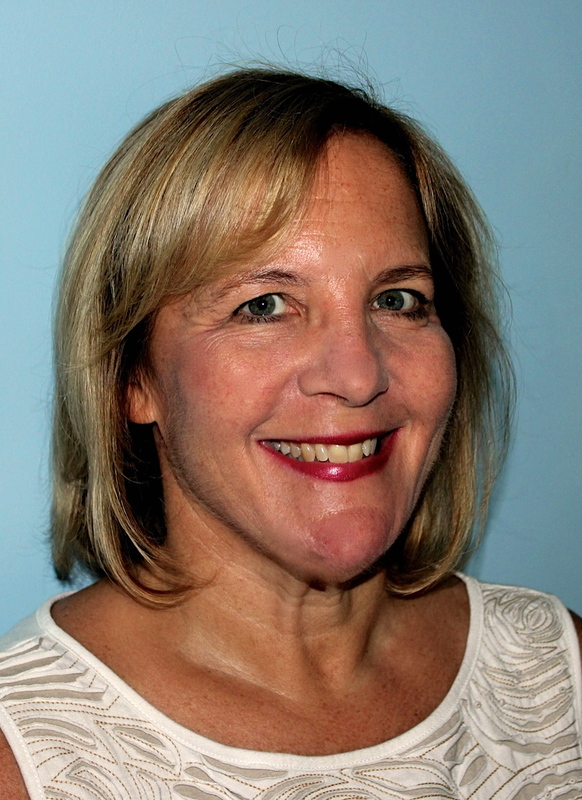 The town’s Affordable Housing Coordinator, Cindy Reid, will be stepping into the Town Attorney role. At the meeting, as Kline was complementing the town’s selection of Reid as his replacement, it was interesting to hear him add “unlike me, she doesn’t have any potential conflicts out there.”"
That was in May of 2016. So, it was really very surprising to see the results of a recent public records request through June 1st 2017 showing Mr Kline still very much engaged with Davidson Town Hall - particularly when it comes to real estate transactions. The request which ran up to June 1st, 2017 shows invoices from Kline to the town for work done every month except December 2016 since his "retirement". Per a separate email from Town Hall, Davidson has "paid Rick Kline $10,453 since July 1, 2016 for projects related to the planning department, town attorney, and real estate". In March and April of this year, that planning/real estate work was around the controversial Beaty Street RFP project and selling public land to an unincorporated group called Davidson Development Partners or DDP. One $400 charge on April 6th was particularly interesting. It's for a conference call with the Beaty Street developer. The email record sheds more light on that meeting. At about noon on April 6th, Assistant Town Manager Dawn Blobaum contacted Kline asking him to attend on short notice and meet with the developer's attorney because they were asking questions Blobaum couldn't answer. What makes this interesting is it shows Kline's close involvement in pushing this project forward. Just a little over 6 weeks later Kline was called to Davidson Town Hall as a witness of sorts for the project to refute activists' claims that the parcel should be used as a park. 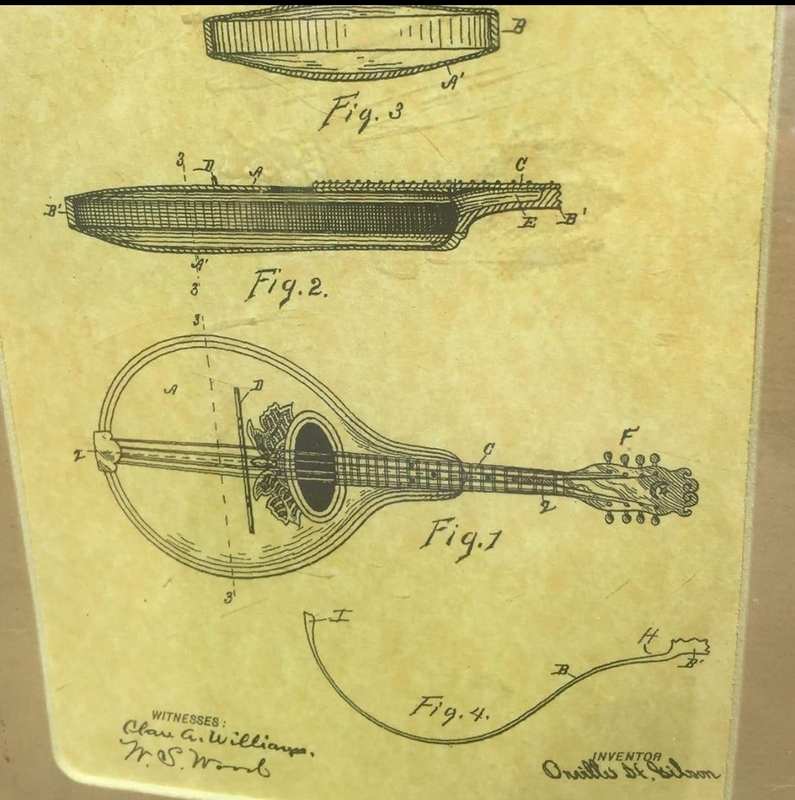 That story and video can be seen in this post titled "Beaty Street: Lawyers, threats, and karma at Davidson Town Hall". 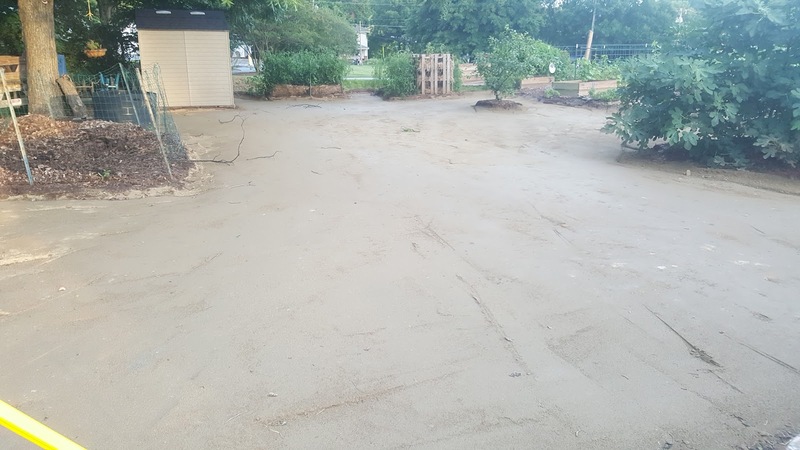 The public records request did not include Kline's invoice to the Town for any work done in May because, again, the request only went through June 1st and that invoice likely had not arrived yet. It would be interesting to know if Kline paid for that testimony or for preparing for it? If all of that doesn't bother citizens enough regarding Mr Kline's continued involvement at Davidson Town Hall after his "retirement" from official Town Attorney duties, the gray area continues involving his private practice helping developers as well. In this single public records request, aShortChronicle counted no less than four private sector projects Kline is working in Davidson. Three of these are unannounced at this point. The one that is public is The Summit at River Run. aShortChronicle will be working on stories for the other three as they develop. The breadth and depth of this continued involvement by the former Town Attorney in development projects is important. It should bother readers because of the obvious chumminess between Mr Kline and the town staff particularly in the Planning Department - the department that has very direct impact on decisions impacting Mr Kline's private sector clients. The public records request is riddled with banter and jokes with one exchange being particularly telling. On September 1st, 2016 Kline asked for a quick 15 minute meeting with Town Planning staff either that day or the next. It was regarding the Summit at River Run project mentioned previously. Planning Director Jason Burdett responded "Just like a developer. Always wanting to meet with no notice! How's 1130?" To that joking comment Kline replied "Perfect! And thanks for the compliment." The saying "fox in the henhouse" comes to mind when one sees this kind of thing, and that is not good - not good at all. But let's be clear, that is not the the fault of the "fox". That is the fault of the Davidson Town Board who left the door to the henhouse wide open. 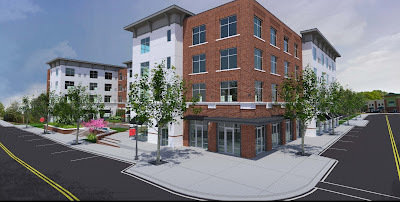 It has been almost a year and a half since aShortChronicle first broke the news of the proposal for a new hotel next to the Community School of Davidson. Then last August the first version of the plan (which was not well received, btw) was delivered. Now, it appears the project is ready to move forward. On Wednesday afternoon, an updated version of the proposal was posted on the Town website. On July 31, 2017 (this coming Monday) the Planning Board and Board of Commissioners will hold a Joint Work Session with the project team. This starts the end game for what could be another contentious vote for this Board prior to election day. See here for the gory details of the new proposal. The new proposal comes in at 4 stories rather than 6 in the original and includes 115 rooms. The parking situation has not improved from the original. 113 spaces are provided, but only 64 are on site. It relies on less shared parking with Woodies next door, but at peak usage will need all available street parking in the vicinity. 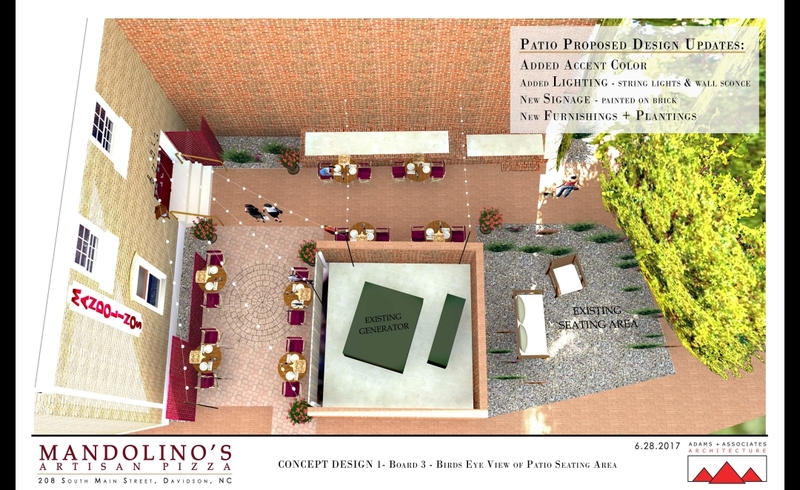 There is no mention of a rooftop restaurant in the new proposal. Check back over the next few days for updates on this project and this Monday's meeting. Who would have thought Davidson would end up being this year's ground zero for "most interesting elections to watch" in North Mecklenburg, but that's exactly how things are shaping up after the close of the filing period last Friday. Both Huntersville and Cornelius have uncontested races for Mayor. Mayor John Aneralla is seeking re-election in Huntersville. In Cornelius, current Commissioner Woody Washam is unopposed seeking the Mayor's spot since current current Mayor Chuck Travis decided to not try for another term. All of the remaining incumbent Commissioners in both towns filed for re-election except for Commissioner Rob Kidwell in Huntersville. That means each of those boards are guaranteed one new face, but to get more an incumbent has to lose. That's always a hard thing to do. In Davidson, things couldn't be more different this time around. Three candidates are vying for Mayor (John Woods, Rusty Knox, and Laurie Venzon). This will definitely be Mayor Woods's biggest electoral challenge since becoming Mayor a decade ago. Both Knox and Venzon are well known names in Davidson politics. Rusty Knox comes from local political family, and he is well known in his own right as a musician. Importantly, in recent years he has been leading the charge against many of Town Hall's most unpopular ambitions. Venzon served previously as Mayor Pro Tem on the Board and is familiar with how Town Hall operates. Between the two of them, the challenger best able to coalesce the "Not John Woods" vote and eat into Wood's loyal base, stands to take this contest. However, if that doesn't happen, in a three way race Woods could squeak by with likely less than 50% of the total vote. On the Commissioners side, things are no less chaotic. This race has turned into a major contest with thirteen candidates filing for five spots. Typically, such a large number of candidates is due to some known open seats going into filing. Open seats where an incumbent doesn't file for re-election attract candidates because of the possibility of getting a seat without having to knock off a sitting Commissioner. Going into the filing period that wasn't the case in Davidson. All of the incumbents were mum on their intentions, so many assumed all would file for re-election. Ultimately, though two incumbents did not file - Mayor Pro Tem Beth Cashion and Commissioner Brian Jenest. While there were rumors out there that these two might not file they were never confirmed, and ultimately having two Commissioners not file was a surprise to many. So what caused the large number of challengers if it wasn't known open seats? Issues and controversy, that's what. It looks like a long simmering discontent with Town Hall finally boiled over and that spurred the large number of candidates with only a few of the challengers being well known names. Incumbents Jim Fuller, Rodney Graham, and Stacey Anderson filed for re-election, but they are outnumbered by 10 challengers. 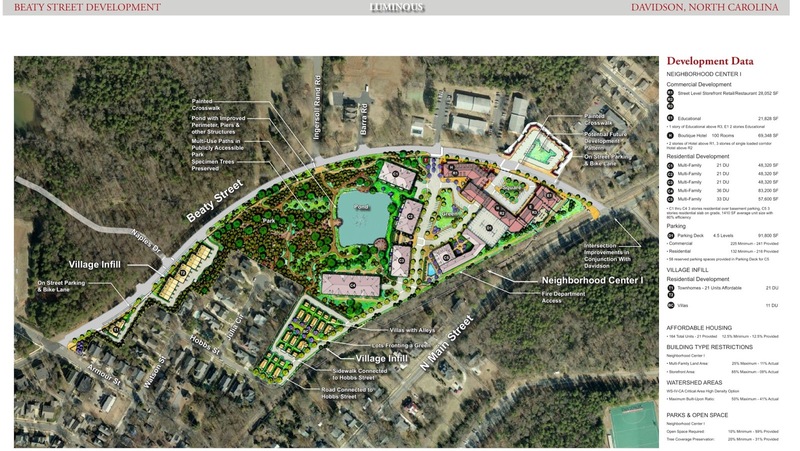 Due to controversies over the past two years that have emanated from Town Hall like the Catalyst Project, the Rural Area Plan mass rezoning, and most recently the Beaty Street RFP, any incumbent is probably at risk with Graham and Anderson more so this time due to their recent Beaty Street vote. Of the three, Jim Fuller is probably in the safest position because he has been on the right side of these contentious issues much more often than not. The dynamics of this race will be interesting. With the real possibility of a 4-5 new faces on the Board and so many candidates to choose from, voters will have their work cut out for them. If a solid slate of candidates comes together to challenge the remaining incumbents, or four challengers plus maybe Fuller, that could leave the remaining incumbents and challengers to resort to single shot voting to have a chance at getting on the new board. aShortChronicle had previously told readers in this post from 2015 that single shot voting was a way to super charge your vote and help break the grip of incumbents. This time around those incumbents may be the ones who need to use it. Wasting no time getting on the campaign trail after filing closed on Friday, Davidson Mayor John Woods opened his re-election campaign with a lengthy email blast to what appears to be a long list of email contacts. Here is the meat of the announcement without all the opening and closing campaign fluff. "The work of the town will continue throughout the campaign, and I will remain fully focused and present on all deliberations, working with the commissioners and staff to make the best decisions for our community. Our top priorities involve honoring our core values and enhancing Davidson's character and sense of place. Our current goals include welcoming our new Police Chief Penny Dunn, opening Fire Station #2 to continue to improve our excellent public safety, and responding to the need for expanded town hall facilities and downtown parking. We must renew our commitment to affordable housing, apply our planning ordinance to proposed new developments, and follow the vision we have established for ourselves. The financial health of Davidson is always a priority. Spending my professional career as a banker taught me that our continued secure standing will be protected with new employment opportunities and sound economic growth policies. It has been my honor to represent Davidson at the regional, state, and national levels, creating partnerships and collaborations that further our interests, wherever possible." No mention of Mayor Woods's involvement and vote to create Mi-Connection, the worst financial disaster to ever hit this town. No mention of his unfailing support for the I77 HOT Lanes project, the worst project in the history of the Lake Norman region. No mention of the town's highest taxes and fees in the area or the new taxes to be imposed if Mayor Woods and the majority on the current Board get their way with their spending proposals - harming affordability in the process. No mention of his support for unpopular local projects emanating from the Town Planning Department (Catalyst, RAP Mass Rezoning, Beaty Street) - projects that have sparked a 'Save Davidson" movement to save the town from the the kinds of things Mayor Woods supports. Rather than a list of accomplishments, there is a lot of denial in this announcement - denial of what Mayor Woods has put this town through over the years. As this election season kicks off and Mayor Woods faces his toughest re-election campaign yet, this denial laden announcement may very well have been the last one of these he ever gets to make. aShortChronicle has obtained the results of a public records request confirming what most people thought after last week's Beaty Street RFP vote. The "votes" were in fact counted prior to the meeting. Readers will remember that on the Friday before the vote, the town meeting agenda presented an option that had removed the affordable housing component. Then on Monday it became known that was being replaced in favor of a payment in lieu option for that component. On Tuesday, Commissioners Stacey Anderson, Rodney Graham, and Brian Jenest voted to support a new Luminous option that had on-site AH back in the plan. 9:58pm - DDP sends email to Dawn Blobaum with new plan that puts on-site affordable housing back in the proposal. 7:02am - Blobaum sends Commissioners the new plan with this request. "Please let us know if you can support this tonight. 7:32am - Commissioner Stacey Anderson replies "I can support this." 7:36am - Commissioner Rodney Graham replies "Ditto". 7:55am - Commissioner Brian Jenest responds "I support the current proposal." In these emails Commissioners Graham and Anderson also made other comments. Graham asked for clarification of possible County support for parks in this area of Davidson, but said his support wasn't "contingent" on getting that update. Anderson expressed concern for staff's ability to "support the effort that it will take to move this forward including the amount of anticipated public interest". Later that same day, Commissioners Anderson, Graham, and Jenest stuck with their statements supporting the project - proving that what happened Tuesday evening was little more than kabuki theater. Cornelius, N.C. – (July 17, 2017) – On Thursday, July 20th Widen I-77 will be holding a town hall–style event to give their response to Mercator Advisor’s preliminary report on the I-77 toll lane project. Widen I-77 held their last town hall meeting nearly 18 months ago, in March of 2016. Mercator was hired by Gov. Roy Cooper’s Department of Transportation to study the impact of terminating the 50-year agreement with Cintra, changing the $655 million contract, or buying the toll lanes entirely and the right to collect toll revenue. Mercator is expected to give the DOT a range of the possible penalties for changing the contract at the Charlotte Regional Transportation Planning Organization meeting Wednesday night. Widen I-77 has been evaluating the project and finding problems with the contract for almost five years. It is because of the public outcry in the Lake Norman area that the study was commissioned. The meeting Thursday will consist of a twenty minute presentation followed by an extended question-and-answer session. The public, elected officials, candidates and the media are invited to attend. At the midway point in the two week filing period, this year's election in Davidson is setting up to be the most competitive in many years. There will be a real race for Mayor with 3 candidates in the mix - all of them totally viable from an electoral standpoint. On the Commissioners side of the ballot, 8 candidates have already filed. The incumbents face a slew of challengers which will create interesting dynamics in the two different races. So far, Mayor Woods faces Rusty Knox and Laurie Venzon. Knox is very well known around town and has been leading the charge over the past couple of years against some of the unpopular ideas emanating from Town Hall. Venzon is a former Commissioner seeking to return to the Board in the top spot as Mayor. The dynamic, and danger from the challengers' perspective, in a three way race is that the challengers split the anti-incumbent vote and the incumbent squeaks by. As an example, in a two way head to head race against an unpopular incumbent, it would seem likely either Knox or Venzon would beat Woods handily - say 60% to 40%. However, in a three way race if Knox and Venzon split the anti-Woods vote and Woods's share of the vote is solid, then Woods could stay in office winning 40%, 30%, 30%. In this scenario one of the challengers has to win an overwhelming share of the anti-incumbent vote. On the Commissioner's race several new faces are on the ballot already. There is also the distinct possibility of 1 or more "open seats". In Davidson, all 5 Commissioners are always up for election at-large. The term "open seat" just means an incumbent has decided to not seek re-election. When that happens it attracts more challengers because it is guaranteed there will be a new face to fill each open seat. Beating incumbents is always hard to do, but in this election, the incumbents have supported various unpopular projects in varying degrees over the past two years. Between the real possibility of open seats and this incumbent unpopularity the dynamic of the race can change dramatically. The top five vote getters make the Board, and this race is shaping up to be close with the potential of an anti-incumbent wave. However, just like things can change in the second half of a Davidson Wildcats basketball game, we will have to wait and see what happens next week in the second half of the filing period. The buzzer sounds and filing closes Friday, July 21st at noon. 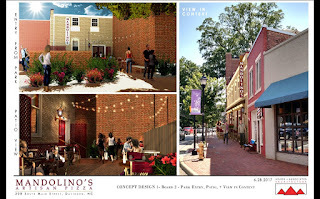 Been wondering what will go in the space where Millstone Bakery and Upper Crust used to be on Davidson's Main Street? 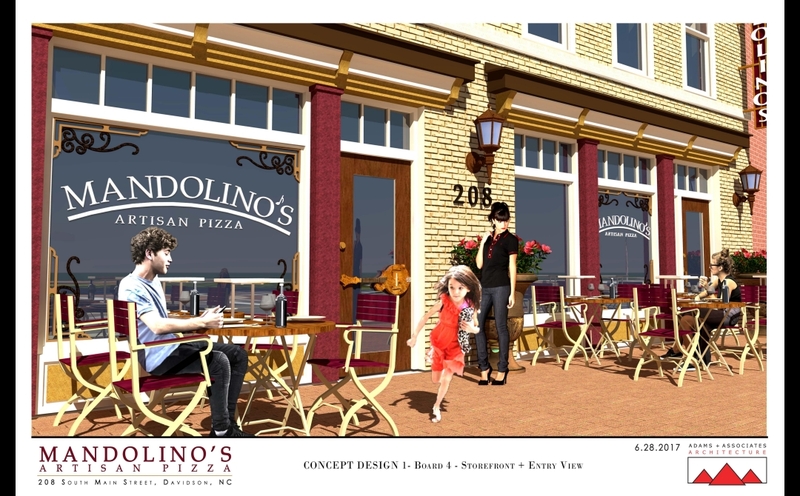 Back in early June, David Boraks posted on Facebook that it would be a new pizza place called Mandolino's. 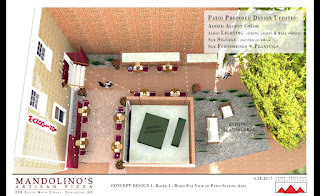 Well, now people can see what the future restaurant might look like. 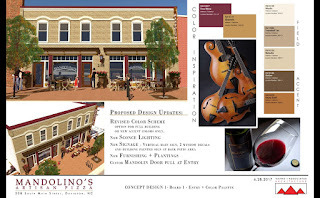 The project comes before the Town's Design Review Board on July 19th. The below pictures are from the DRB application required for the changes to the building. aShortChronicle heard from Michael Orlando on the preliminary plans for the project. 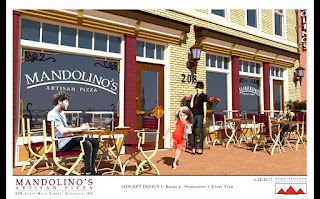 Orlando says Mandolino's Artisan Pizza is targeting Sept. 15, 2017 for opening as a farm to fork artisan pizza restaurant occupying the ground floor of building (206 S. Main Street) formerly occupied by Millstone. Hand-made ingredients, locally sourced, will be brought to you by the owners of Flatiron Kitchen across the street in Davidson. Asked about plans for the upstairs space, Orlando said "we will also occupy the second floor space formerly Upper Crust but have not decided on a final concept yet, though we expect to offer a bourbon bar, live music and event space." High end pizza, good spirits, and live music all in one spot. That's something every college town needs, and now it looks like Davidson will finally be getting that right on Main Street. "So, I have changed my mind during this meeting." Those were the words Commissioner Stacey Anderson uttered to start her comments as Davidson Commissioners made their closing arguments before voting on the Luminous project and the sale of the Beaty Street property this past Tuesday. Anderson ultimately voted for the project, and that left many, many people very, very confused. aShortChronicle went back to the video and listened multiple times to see what might have been missed. Here is what Anderson said. "So, I have changed my mind during this meeting. But I still think this is the best plan, the best for Davidson" She goes on to talk about how great she thinks the plan is and about the money it will bring into the town. She says she thinks it meets all the town core values. Then she closes with this statement. "But I don't think the town can take the pressure, the tearing up, the anxiety it is taking to do this. 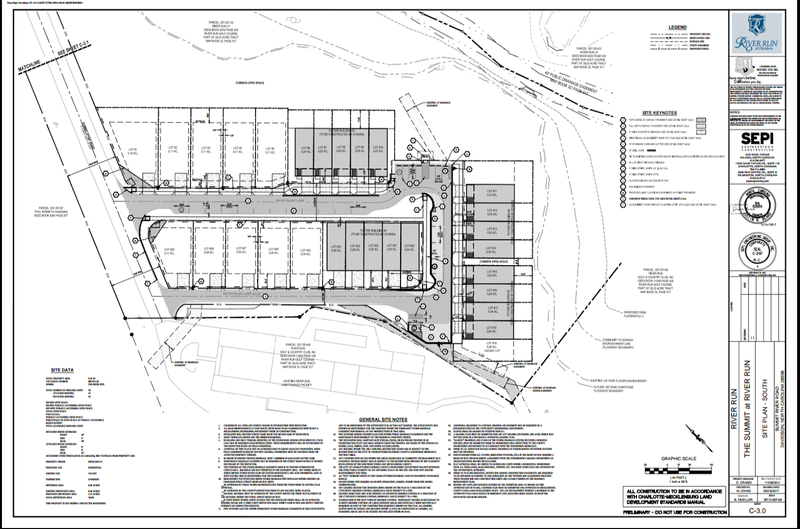 But, aside from that, this is probably the best plan you'll ever see on this property." Taken all together this certainly sounds like someone who was for the project and then switched to being against the project because of what it is doing to the town. Anderson's comments came immediately after Commissioner Jim Fuller received major applause for his statements and strong commitment to vote against the project. They came after hearing dozens of citizens speak against the project. After she spoke, Commissioner Rodney Graham spoke at length for the project. Graham, along with Commissioner Brian Jenest also voted for it as well. Taken all together, Anderson's ultimate vote for the project after her comments actually means she appears to have changed her mind twice. She was for the project going into the meeting; against the project after hearing from citizens; then she was back to being for the project again just a half hour later when the votes were cast. Graham and Jenest work in the development industry, and just like sharks bite at the beach in summer, developers build. Their votes are wholly unsurprising. What makes Anderson's waffling so difficult to accept on such an impactful vote is that hers was the swing vote. Her vote made it 3-2 for the project. Swing votes are important. By definition, they cause something to go one way or the other. Commissioner Stacey Anderson, now more than any of the other Commissioners, bears responsibility for the sale of the Beaty Street property and the Luminous project going forward. As of this posting, Commissioner Anderson has not filed for re-election. The filing period ends one week from today. Update: Commissioner Anderson filed for re-election on Friday the 14th. Townhomes for River Run...who'd a thunk it? An old, but new project just popped up on the Town website yesterday called Summit at River Run. According to the project page..
"Summit at River Run was originally approved July 26, 2004. Infrastructure was added shortly afterward. With vested rights per the infrastructure, the plan has recently been revived for review by Mecklenburg County and the Town of Davidson. Construction will likely begin in the fall of 2017." 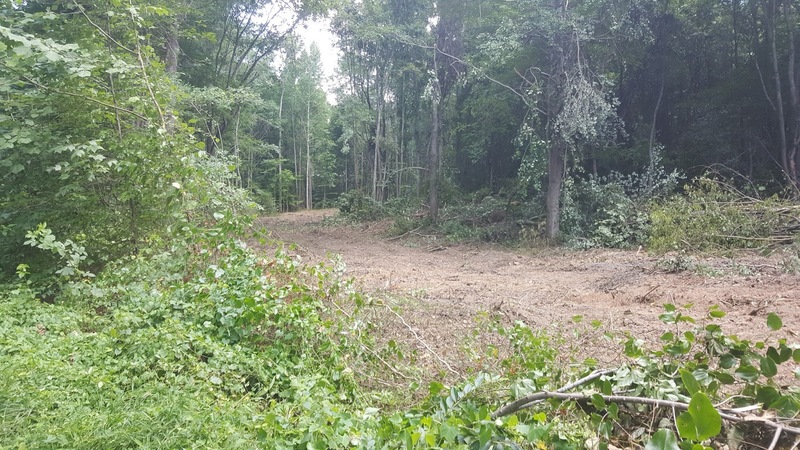 The project will consist of 10 single family homes and 18 townhomes in what basically amounts to a cul de sac off of East Rocky River Rd. aShortChronicle contacted the town and found out any required affordable housing will likely be a payment in lieu. 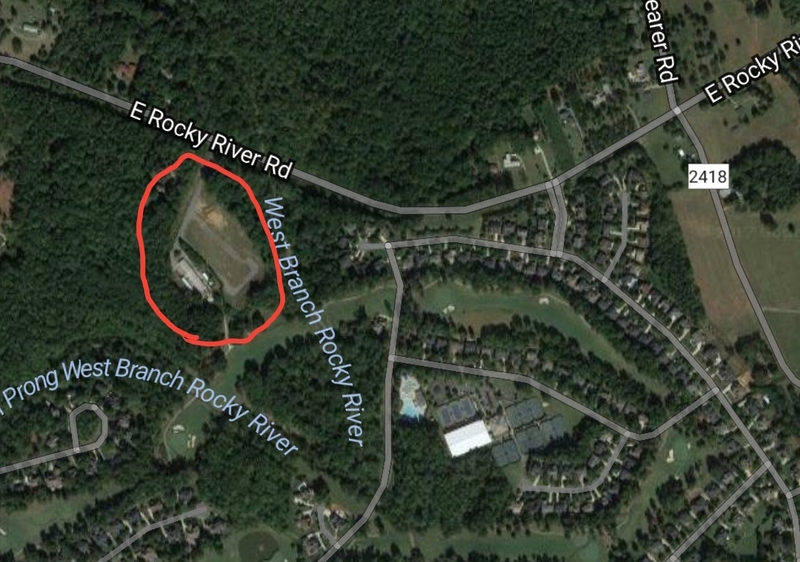 Also, the project appears to be disconnected from the rest of River Run with no street connections into the larger neighborhood. After nearly 90 minutes of public comment on the Luminous project proposal (almost all of it strongly opposed) Davidson Town Hall made a packed house wait until the last item on the agenda for a decision. At the meeting, a 4th option for the Luminous proposal was presented for the first time, and this one did have on-site AH put back in the plan. (See update on the previous post.) That's a change from what was available online just the night before and one whose details had not been presented to the public at all previously. After each Commissioner took their turn making their case it was unclear right up until the end how the vote would go. One could rightly assume that the two "developers" on the Board were for building more stuff. That would be home builder Rodney Graham and land planner Brian Jenest. Commissioner Beth Cashion spoke very favorably of the project, but ultimately said she couldn't vote for it largely because of timing it seemed. Commissioner Fuller made an impassioned speech against the project recounting the numerous people he has spoken to over the past months. That left Commissioner Anderson to be the deciding vote. Her comments left her position unclear other than her saying she had changed her mind during the meeting (which of course was also still unclear). It was then time to vote. Commissioner Fuller motioned to table the decision indefinitely. Then Commissioner Anderson motioned to go forward and form a committee - yes, another committee with citizens who will be nothing but political cover - to work on the contract with DDP. The crowd sat in stunned silence for a few seconds. Then, there were a few murmurs. Then...well, then it was time to leave. 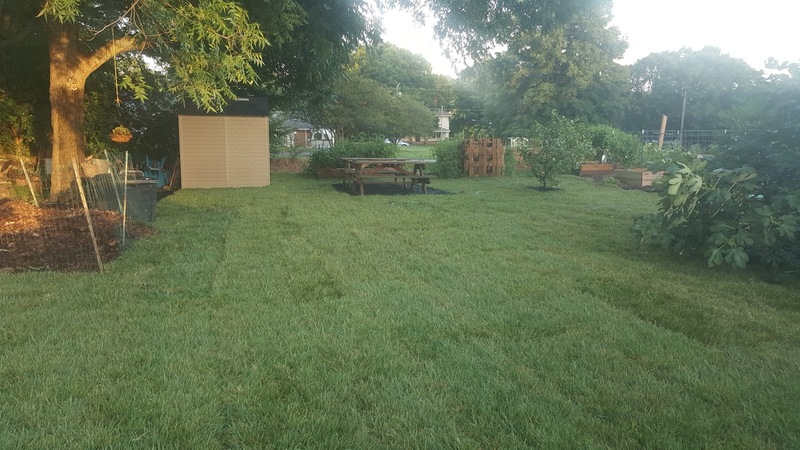 WHO: Davidson citizens are planning a “Save Davidson” protest to continue voicing their objections to the town commissioners ignoring a 1985 signed contract and numerous other documents that indicate there was an agreement to make the Beaty Street Property a park. 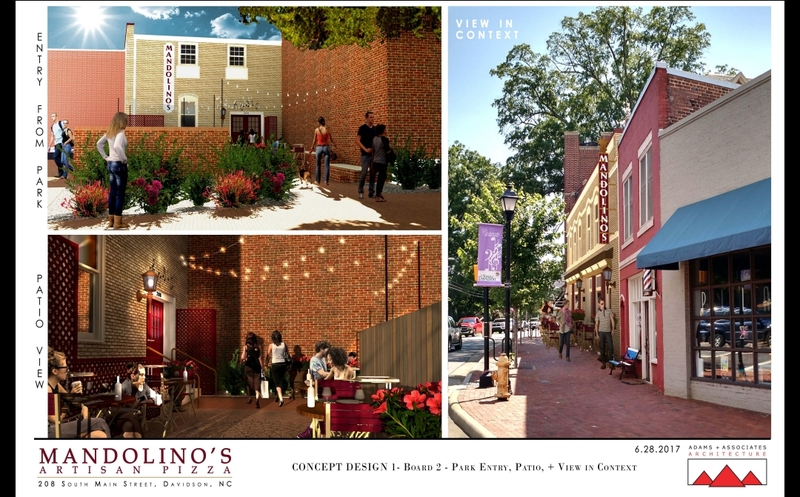 WHAT: Citizens’ primary concern is that the town board will vote to move forward to develop the Beaty Street Property. Citizens view this as a violation of an agreement the town made in 1985 with Mrs. Venie Clontz. 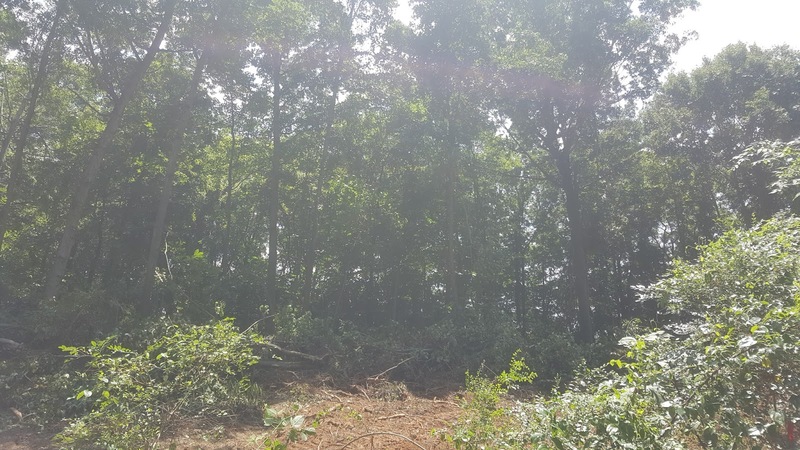 The group known as “Save Davidson” has released a 60-page document that includes numerous documents that indicate the property is to be a park. WHEN: 5 to 6 p.m. Tuesday, July 11, 2017. This is the evening that the town board meets at 6 p.m.
WHY: Citizens are concerned about the disregard of a contract, betrayal of public trust, flawed process, lack of transparency, failure to include and acknowledge citizen input on publicly owned land along with increased traffic, loss of tree canopy and open space, and adverse effects to water and air quality. The Town owns the land, not developers. A Mecklenburg County Park and Recreation commissioner cautions about the loss of town-owned land to development considering projections for growth in the region. After numerous documents have come to light citizens are concerned the town is not keeping its word. aShortChronicle has received multiple reports of last minute concerning issues which could and definitely should make the Town rethink approving the Beaty Street RFP and the newly revamped Luminous proposal when it votes Tuesday evening. The first issue involves legal cases from Puerto Rico where multiple members of the "Davidson Development Partners" are domiciled. A search of the NC Secretary of State website shows DDP is not yet an actual incorporated legal entity in North Carolina (even on the eve of this critical vote). aShortChronicle understands from those familiar with the details these cases that they raise potential questions about the vetting of the parties to this potential deal with the Town. If the details of these cases have not already been delivered to the Town, they will be soon. This vetting (or lack thereof) of business partners should be very concerning to Davidson voters and taxpayers. The last time the Town involved itself in business deal of this complexity, it ended up with the Mi-Connection albatross around its neck. The Town did not complete a thorough due diligence and ended up having to buy many "customers" who were really nothing but "bad debt". What real assurances do citizens have that this Board isn't getting the town into a similar situation? How do citizens know for example that DDP truly has the resources to see the project through and that in the event of unforeseen events the project doesn't get stalled once the land is cleared? The second issue that has come to light in the last day, is much more straight forward. That is with the new Luminous plan itself. As part of the RFP, Davidson Town Hall demanded affordable housing. As aShortChronicle told readers in this earlier post the initial notes provided by DDP said the AH component in the new plan would be mixed in throughout the development. The presentation released on Monday as part of the updated meeting agenda item tells a much different story. Instead of mixing in AH units with the other residential development, the new DDP proposal includes a payment in lieu of building the actual units, lowers the total number from 20 to 17, and the real kicker appears to be the $1.65m offer now includes the PIL. That last part would mean the town is really paying the PIL out of its own end compared to the original deal. 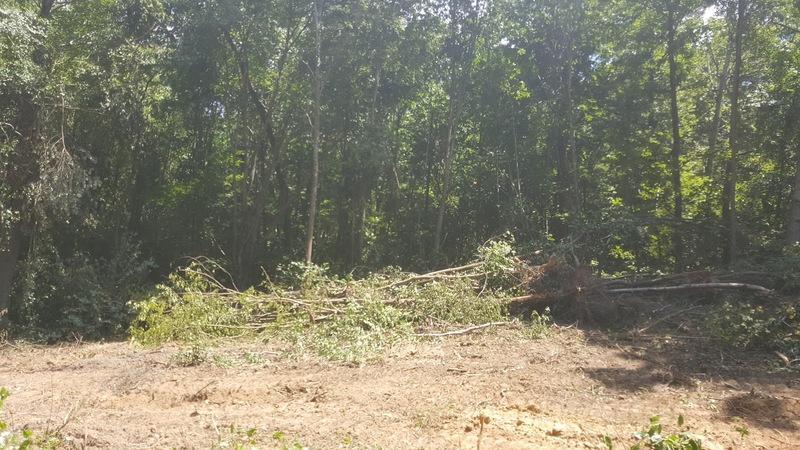 If the Town were to accept this proposal, it is hard to see how it would not leave itself open to action by the other bidders who did make proposals that met the RFP requirements. Also, if the Town accepts this bid it would certainly not be keeping with its supposed support for affordable housing as a core value. Finally, aShortChronicle has seen information that this new proposal is not sitting well with the Town's long standing most ardent supporters of the AH program outside of Town Hall. With all of this new information coming to light less than a day before the vote is scheduled to take place, Davidson Board Members need to rethink any support they have for this project and vote "no" on Tuesday. Update 1: Well, this AH subject may have hit a nerve. Sometime on Tuesday the presentation with the AH information presented above was removed from the Davison agenda and replaced with this one. A 4th option was added, and we are now hearing some form of AH may be back in. 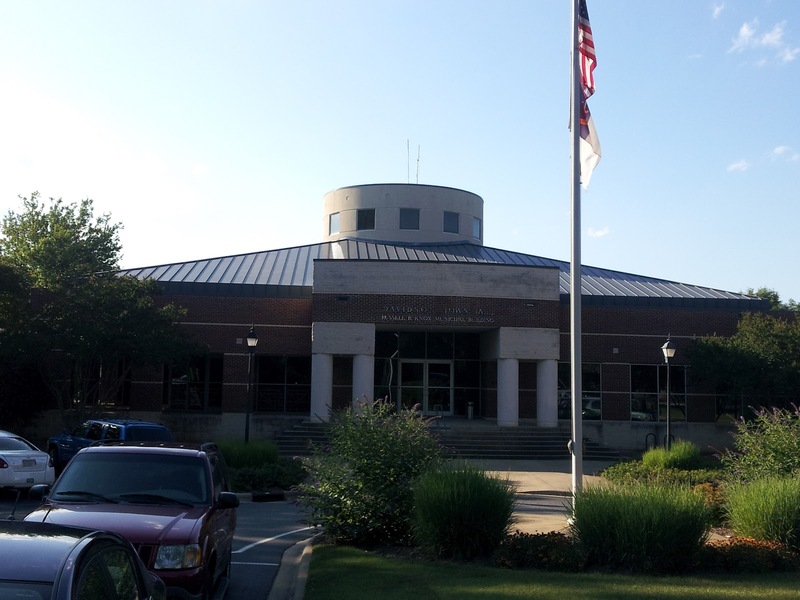 aShortChronicle has confirmed with multiple people in attendance at the Mooresville Town Hall meeting where reports indicate the Board has voted down the Lake Davidson rezoning request. While details are still coming in from people in attendance at Mooresville Town Hall, this much is known. The vote was 4-2 against the rezoning request as a "straight up" request. Approaching 1100 petition signatures opposing the rezoning request were collected prior to the meeting. Commissioner Coble and Mayor Atkins were asked by residents via an attorney to recuse themselves after the embarrassing revelations last month of text messages between themselves mocking citizens who opposed the rezoning request. On the flip side Commissioner Beaver spoke strongly against the rezoning receiving major applause from the audience. He expressed concern for people in Davidson and the ETJ - people who can't even vote for him - showing that doing the right thing can in fact trump $$$ into town coffers. Eventhough this decision was for the Mooresville Board to make, if this decision had gone the other way Davidson would have born the brunt of the negative consequences. aShortChronicle caught up with Davidson Mayoral Candidate Rusty Knox who was in attendance at the Mooresville meeting. Here is what Knox had to say on the outcome. "Tonight after months of discussion and countless hours of public input the Mooresville Board of Commissioners made the decision to deny the Lake Davidson rezoning request. The Board listened, the Board asked the right questions, the Board acknowledged the lack of defined infrastructure to support the project without being detrimental to its constituents and turned down the request. Public input matters." Knox is of course very correct. Public input does in fact matter. Monday evening is proof positive of that. aShortChronicle previously told readers about a minor amount of asbestos found near the DCG as part of the ongoing EPA efforts related to the Metrolina Warehouses effort and its decades ago asbestos factory. No asbestos was found in the actual food producing area of the garden, but off to the side where digging has never really occurred. The scheduled cleanup happened over a few days. Here are some photos of the progress. 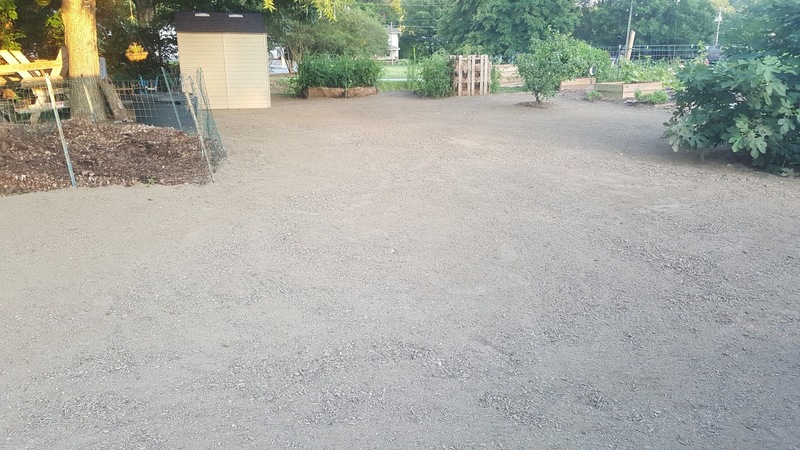 Day 1 - Top several inches of soil removed and a layer of sand placed on the ground. 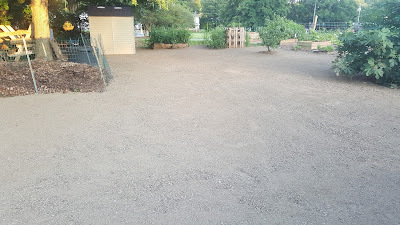 Day 2 - New topsoil put down. Day 3 - New sod. 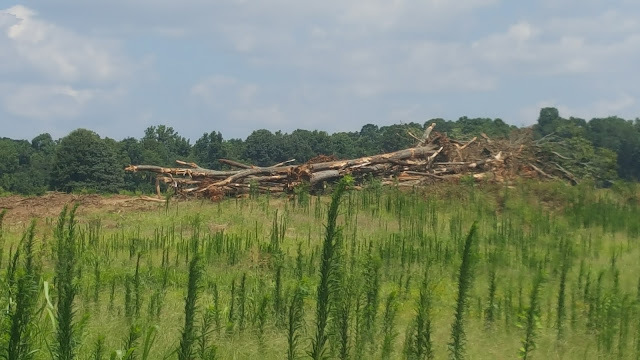 Big development related decisions are on the agendas for Mooresville/Davidson on Monday/Tuesday this coming week, and each is likely to yield some controversy. 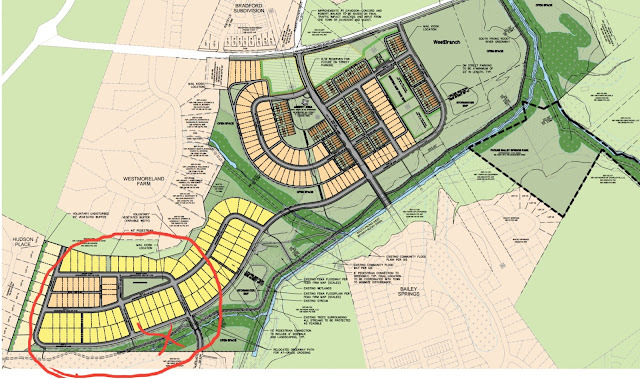 Social media sites are encouraging people to attend and show their displeasure with the Lake Davidson development rezoning request in Mooresville on Monday and with the Beaty Street RFP developer selection in Davidson on Tuesday. See here and here for the details on each. Citizens opposed to both projects have been working diligently - pursuing any and all options to derail these large scale projects that will occur in close proximity to each other, on similar propose6thd timelines, on already overcrowded NC115. To date, those efforts appear to have fallen largely on deaf ears at local Town Halls. Enough shenanigans have certainly come out of those halls of power to have earned officials the ire of the people they supposedly represent. See here, here, here, and here for examples. 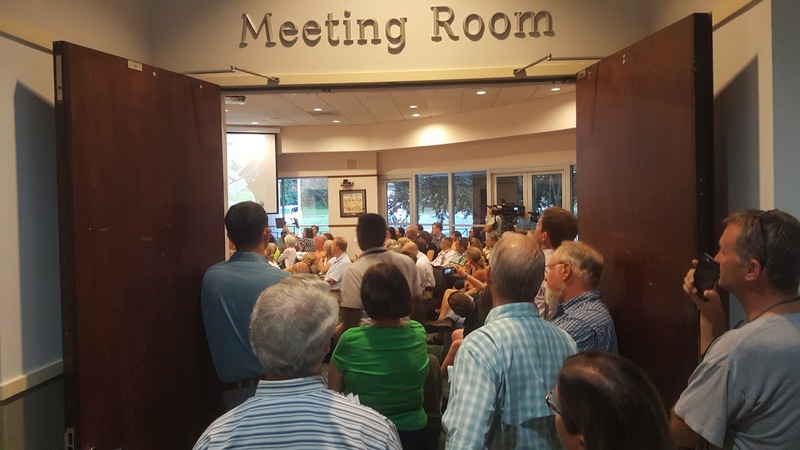 aShortChronicle has received indications that both meetings could see some surprises as activists pull out all the stops before potential votes that could change this portion of the Lake Norman area from bucolic small-town America to Birkdale on steroids. Stay tuned as this story unfolds over the next few days. 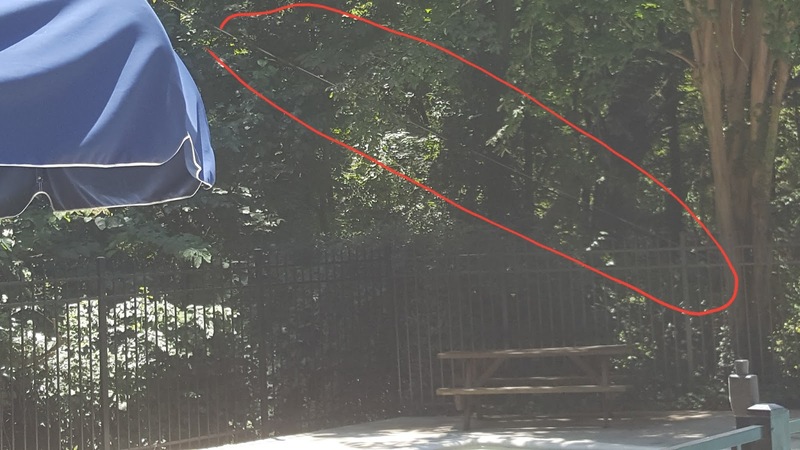 If you were planning to head to the Swimming Hole in Davidson Saturday, you may want to call ahead before going to the pool on Lorimer Street. Saturday morning a fallen tree took out a powerline behind the pool's pump house. 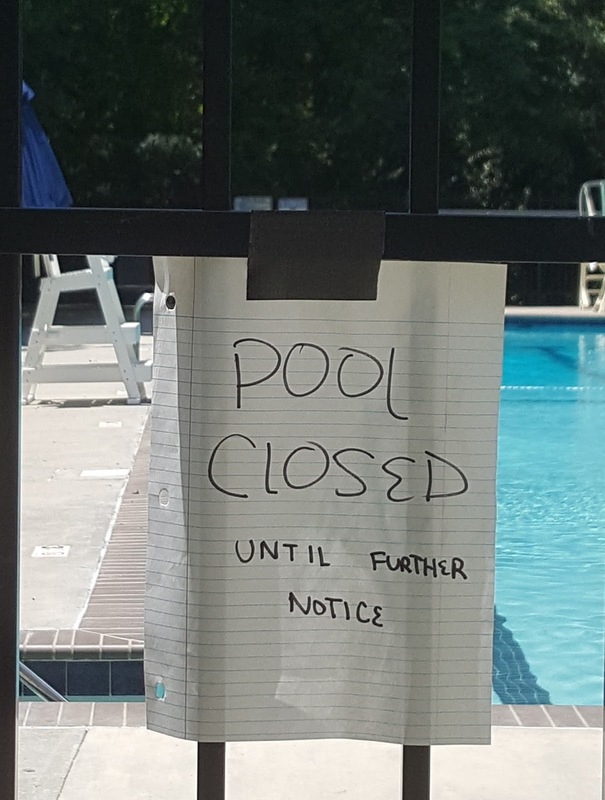 As of 2:10pm Duke Power is currently on site, so hopefully the pool will be back up and running soon. Check the pool Facebook page for updates. 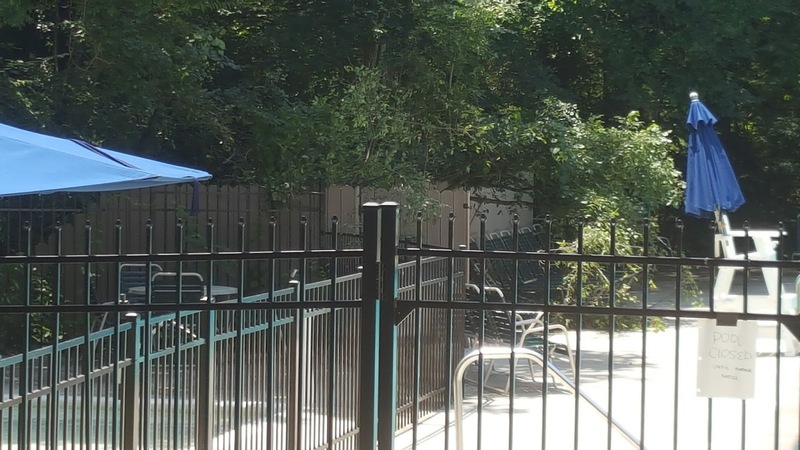 Update: Pool opened on time Suday at noon with the tree cleared away in spite of last night's storms. After Davidson Town Hall botched a planned vote on the Beaty Street RFP last month, it looks like it is set to try again this coming Tuesday. Note the last item on this coming Tuesday's Board meeting agenda- "Consider Approval of Beaty Street Developer". Readers will remember the Town initially scheduled this vote over the planned retirement party for retiring DPD Chief Jeanne Miller then suddenly cancelled the vote mere hours before it was scheduled to occur on June 13th. Those scheduling errors on the Town's part certainly made it look like the Town was using the retirement of its long-time police chief as a potential shield against citizen protests of this controversial Beaty Street vote. That tactic did not stymie protesters who showed up anyway and brought the largest media coverage Davidson has seen in a long time. Seeing how that did not work, now the vote is being scheduled to occur during peak vacation season. There is nothing currently in the agenda item other than the below new Master Plan picture. Here is the original Luminous proposal. While there is no other documentation in the town website on the new proposal other than this first picture, one can assume the differences are from this list of changes sent from the developer dates June 9th. This new plan appears to offer more protection from impact to the Hobbs Hill neighborhood by eliminating the affordable housing complex along Beaty Street and maintaining more tree buffer on the Main Street side. 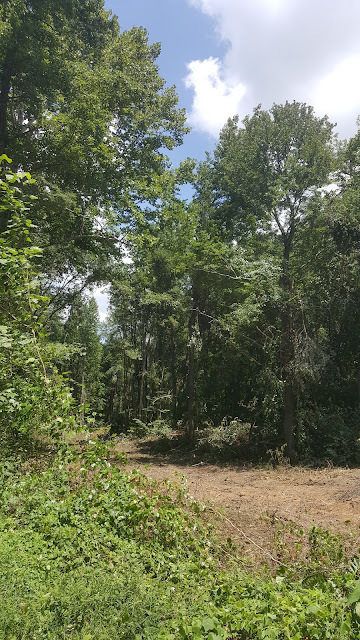 It also bumps up the park acreage to 8.2 acres which is still less than half of the total acreage. Other than that, it looks primarily the same as the original plan. However, it is hard to tell without more detail - detail not yet provided. It is hard to see how the Board could think presenting this new plan and voting on it the same night is a good idea, but stranger things have happened. Would recommend checking the agenda item over the weekend in case more detail is added. 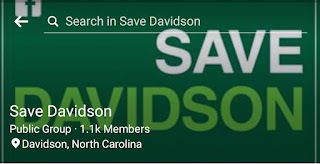 The Save Davidson activist group is getting more organized by the day it seems. Originally started as a Facebook group focused solely on the Beaty Street RFP, the Facebook group quickly expanded and now boasts over 1100 members. That's a tremendous representation and reach for a town the size of Davidson. 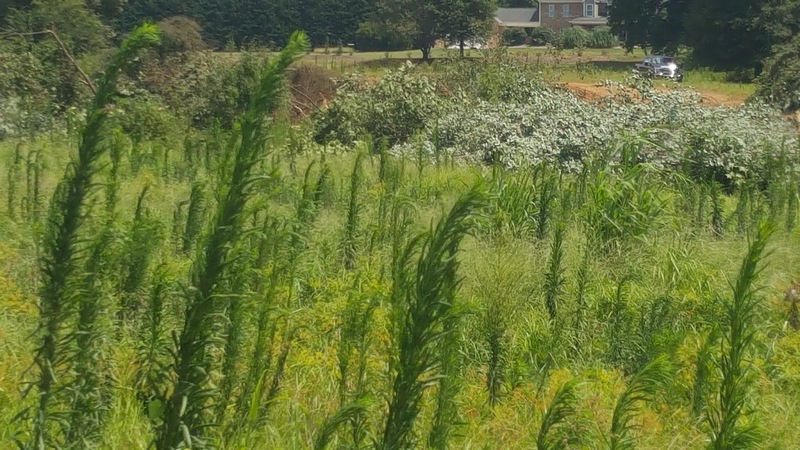 In addition to hosting several nature walks on the town owned Beaty Street property, conducting flyer handouts, and coordinating information sessions at homes around town, the organization has just expanded its web presence as well by launching SaveDavidson.org . As a show of the dedication and research capacity this group is capable of harnessing, a 100 page dossier on the history of the Beaty property and the RFP process was posted to the new website. Check it out here. When a group gets this organized and this active, it is a game changer when it comes to local politics. Look at WidenI77.org for a comparison. While that group hasn't stopped the I77 HOT lanes project - yet - it has had a tremendous impact on our local elections over every election cycle since 2013. It's very arguable the anti-toll group's efforts and the other groups it spawned cost the governorship of a sitting incumbent at the state level. That is in addition to the impact the movement has had on the makeup of the Town Boards in Huntersville and Cornelius. 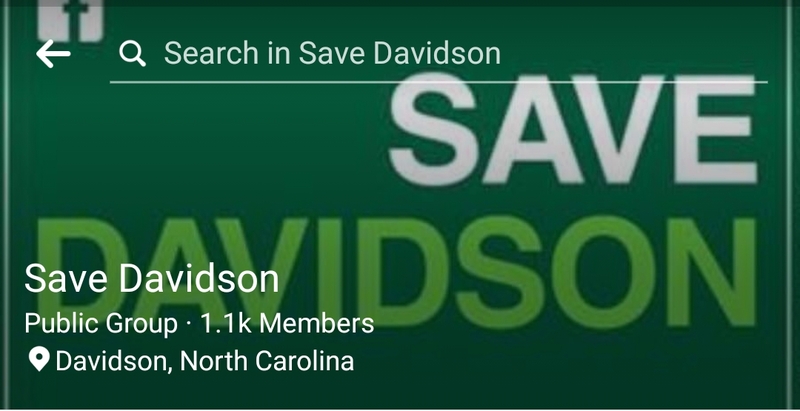 With "Save Davidson", it looks like a similar phenomenon is in the works in our local college town. A big part of the reason for the saying "you can't fight Town Hall" is that Town Hall (or government in general) has a whole staff whose job it is to promote the "official" point of view. It is hard for part time activists to compete against that. When average citizens get organized and leverage the time and talents of many, it changes that dynamic. The balance of power between activists and the local government shifts. Election season starts Friday with the opening of the filing period for candidates. The Save Davidson group is peaking at the right moment to truly have an impact on the outcome. The key will be which candidates does it get behind and which ones it opposes.